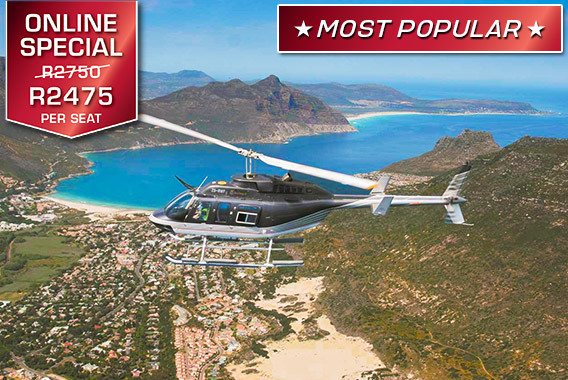 Sport Helicopters is Cape Town’s largest privately-owned tourist helicopter service. 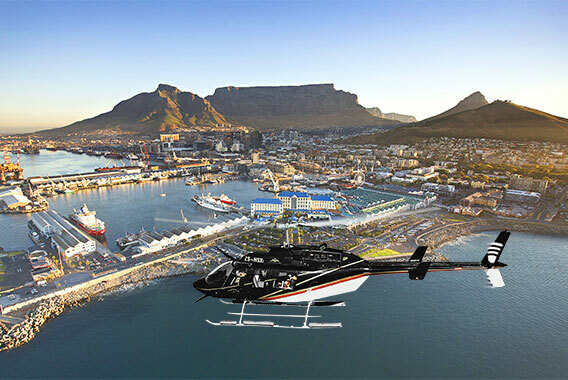 Based at the V&A Waterfront in Cape Town, we offer a wide range of standard and specialised helicopter rides and tours. 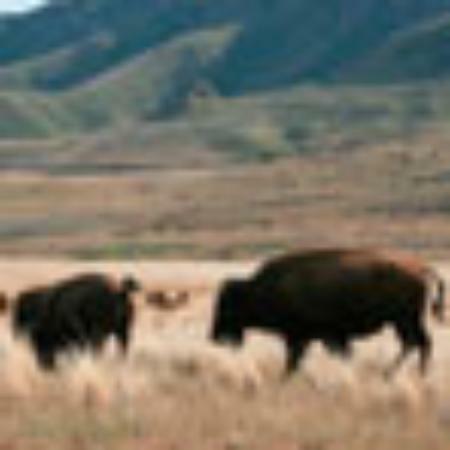 Open door adventure flight in an original American army helicopter – fly the legend! Experience the Ultimate rush of the combat mission adventure flight through the Combat Zone. 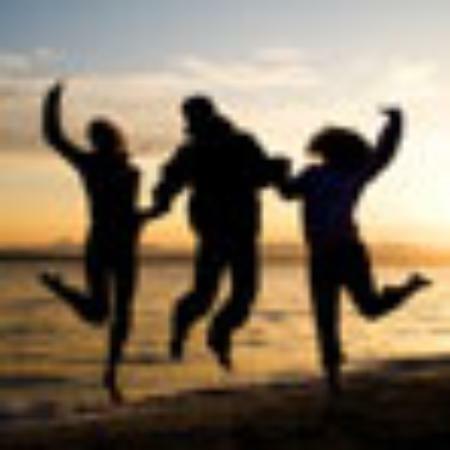 Book Online » Product added! 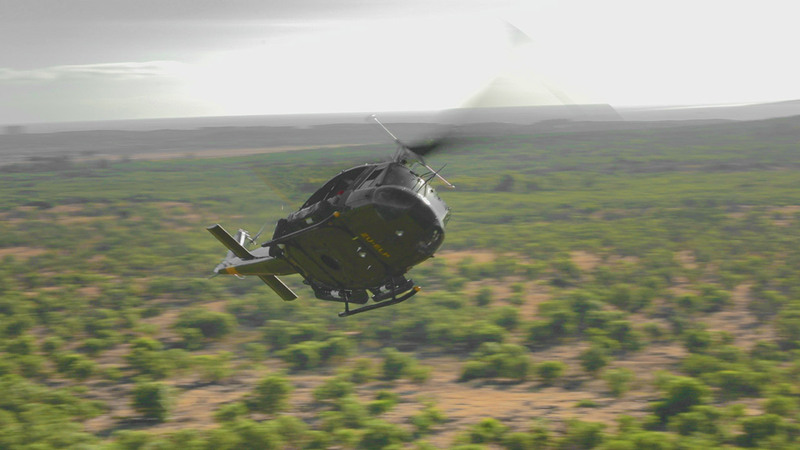 Feel the adrenaline pulsing through your veins and the wind rushing through the open doors during this low level flight on the Huey Army Helicopter. See our beautiful city and the ever popular beach hotspots from the air in the Huey Helicopter. Fly along our breath taking beaches on the Atlantic Seaboard and the majestic 12 Apostles in our original Huey Army Helicopter. 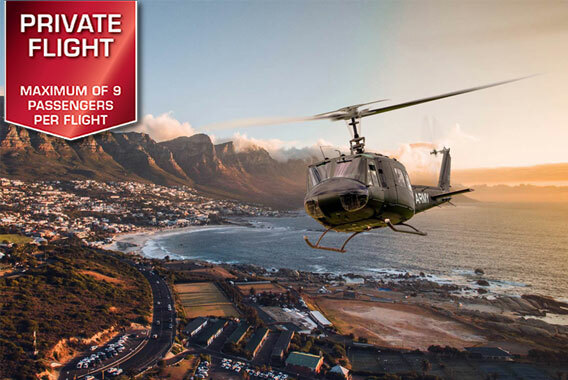 A Huey Helicopter experience that is world renowned and shares the same name as the ever popular Cape Town Two Ocean’s Marathon. 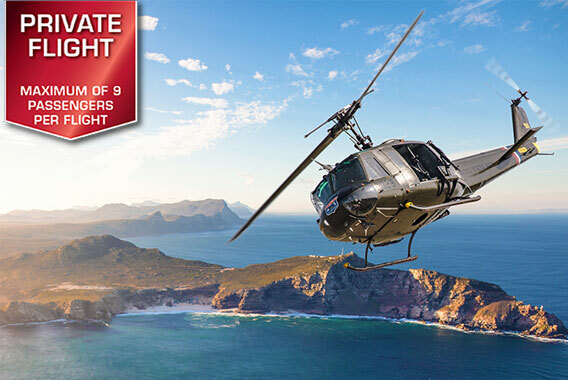 This Huey Helicopter experience will take you to Cape Point, a nature reserve within the Table Mountain National Park. 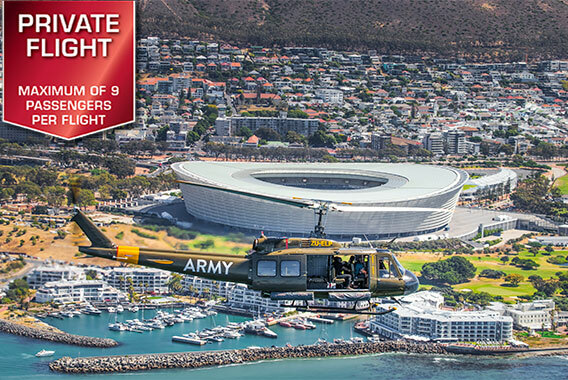 #FLYTHEHUEY is a subdivision of Sport Helicopters Cape Town. We also offer a wide variety of scenic flight routes for you to explore the mother city from the skies. 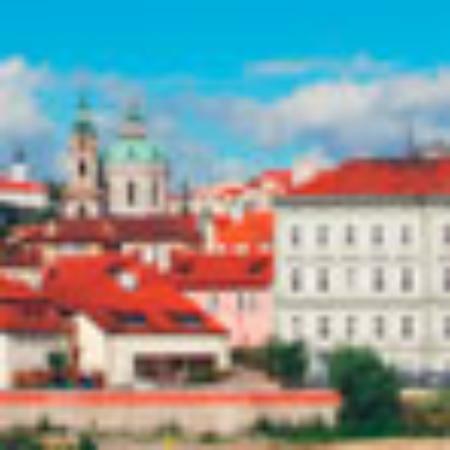 When booking a flight under this section (Scenic Flights) you are booking a flight with a scenic flight helicopter and not the Huey. Please feel free to follow the link below for a list of all our scenic flight routes. 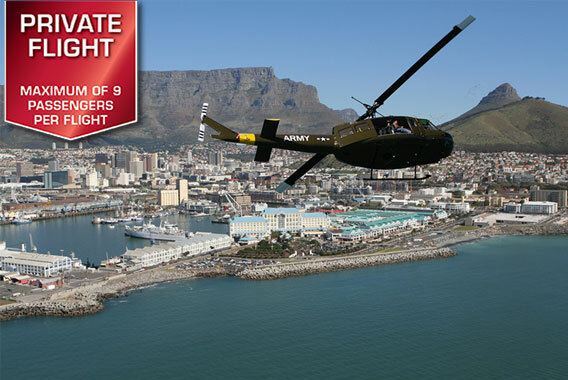 This is a Cape Town Helicopter tour experience that will allow you to see our beautiful city from the air. 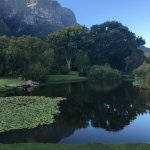 Enjoy a Cape Town Helicopter flight along our breath taking beaches on the Atlantic Seaboard and the majestic 12 Apostles. 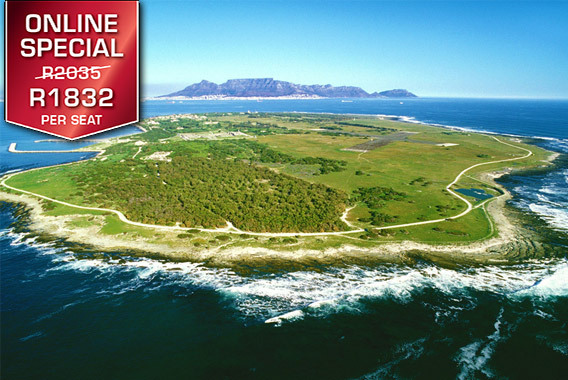 Fly with one of Sport’s Cape Town Helicopters out to Robben Island (Dutch for Seal Island) to experience an important piece of South African History. 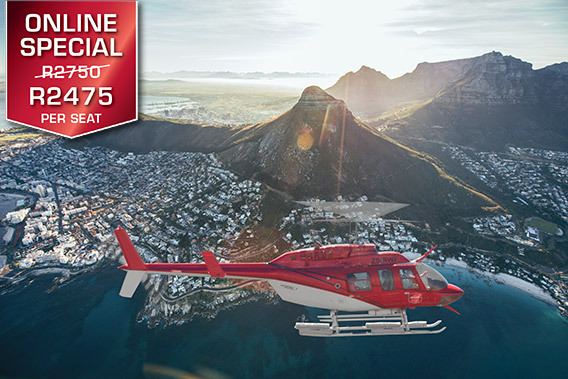 This Cape Town Helicopter experience will be sure to get you excited about exploring more of our beautiful city. 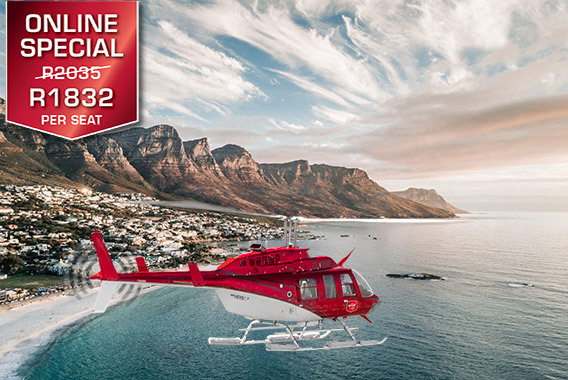 A Cape Town Helicopter experience that is world renowned and shares the same name as the ever popular Cape Town Two Ocean’s Marathon. 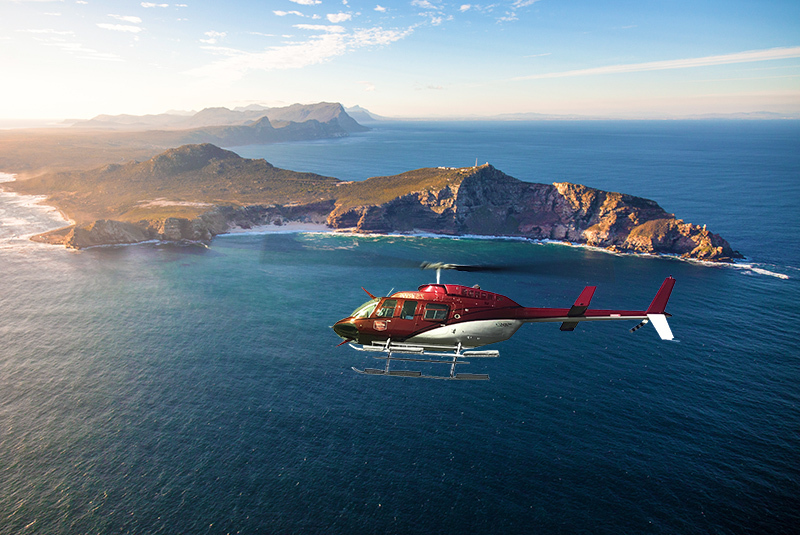 This Cape Town Helicopter experience will take you to Cape Point, a nature reserve within the Table Mountain National Park. When booking a flight under this section (Exclusive Flights) you are booking a flight with an exclusive flight helicopter and not the Huey. 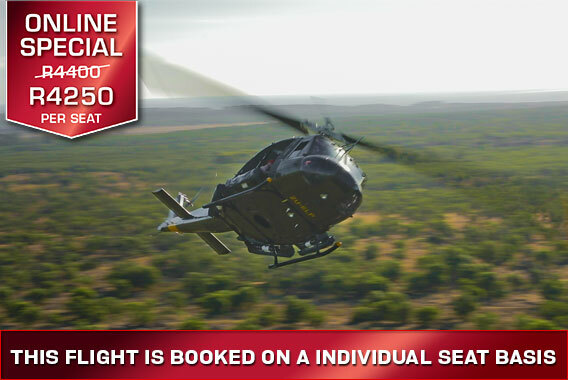 All exclusive flights are subject to a booking with a minimum of 3 seats. Activity costs, lunch and refreshments are not included. 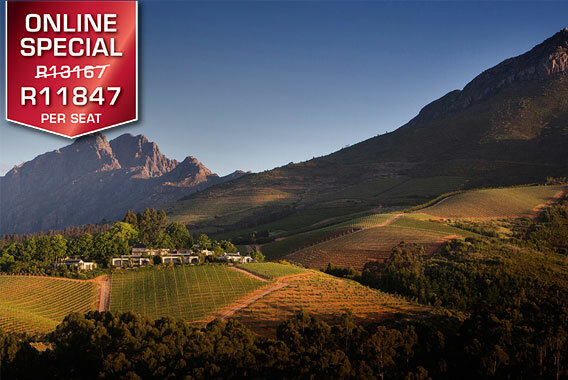 Come fly in one of our Cape Town Helicopters and let the beautiful Wine Region take your breath away as you stop for lunch, wine tasting or both. 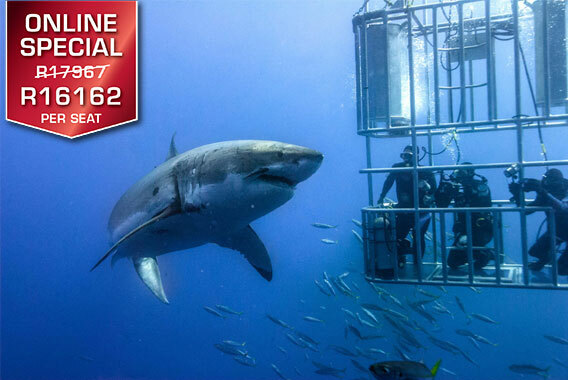 This Cape Town Helicopter experience takes you over Shark Alley which is renowned for the best Great White shark sightings in their natural environment. A true VIP experience. 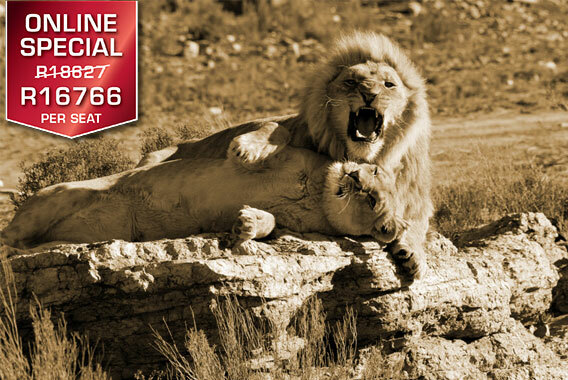 Be flown in one of our Cape Town Helicopters to Aquila or Fairy Glen private game reserve’s and admire Africa’s Big Five. 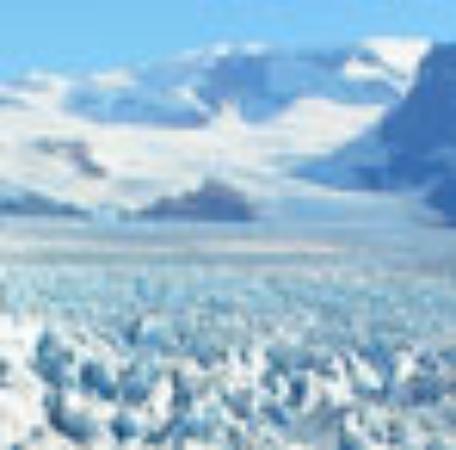 WOULD YOU BE INTERESTED IN A SCENIC HELICOPTER FLIGHT? 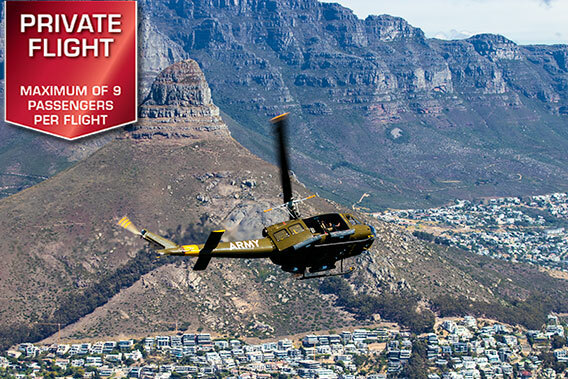 #FLYTHEHUEY is a subdivision of Sport Helicopters Cape Town. We also offer a wide variety of scenic flight route for you to explore the mother city from the skies. Please feel free to follow the link below for a list of all our flight routes. 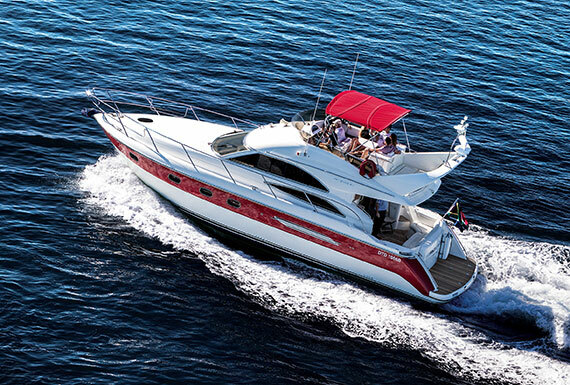 The Sport group also offers private luxurious motor yacht cruises around the beautiful coast of Cape Town. 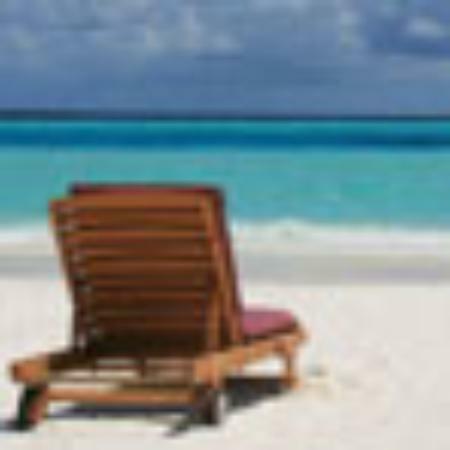 Please have a look at the cruises we have to offer and don’t miss the opportunity to add a magnificent experience to your basket! 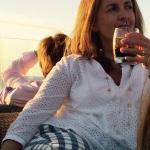 WOULD YOU BE INTERESTED IN A PRIVATE MOTOR YACHT CRUISE? Princess Skye is much more than just a motor yacht cruise… designed to be a magnificent experience. 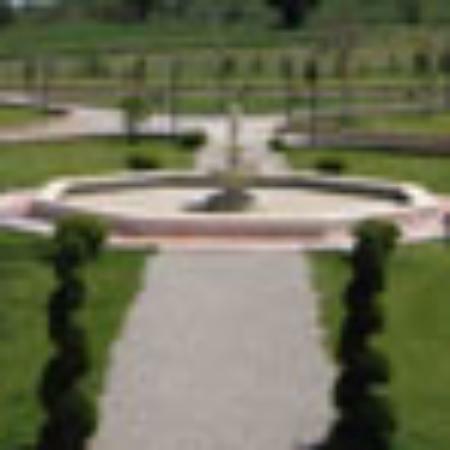 Perfect for romantic couple stargazing, or a group celebrating a special occasion. Flights with Sport Helicopters This was one of the best experiences of my life. The pilots (Altan and Francois) as well as the staff... read moreThis was one of the best experiences of my life. The pilots (Altan and Francois) as well as the staff are very friendly. One life time experience! 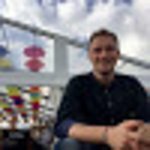 The entire service is very well organized.  All the staff was very kind, specially the pilot, with lot of patience... read moreThe entire service is very well organized. All the staff was very kind, specially the pilot, with lot of patience for all the kids questions. What a View!!! Today we visited Sport Helicopters for a sortie of the Cape Town Harbour, Robben island and Camps Bay. Host and... read moreToday we visited Sport Helicopters for a sortie of the Cape Town Harbour, Robben island and Camps Bay. Host and owner, Robert, and ground-crew Mo and team, ensured we were settled, comfortable and ready to go! Once on the helicopter, our pilot, Kevin Kock, from Bloemfontein, talked us through the take-off and what we’ll be experiencing during the flight. In the air, Kevin treated us to the breathtaking views of Cape Town, See Point, Robben island, Camps Bay, Clifton and the V&A Waterfront. 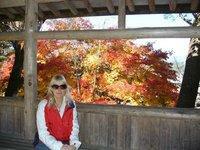 A great experiencing! 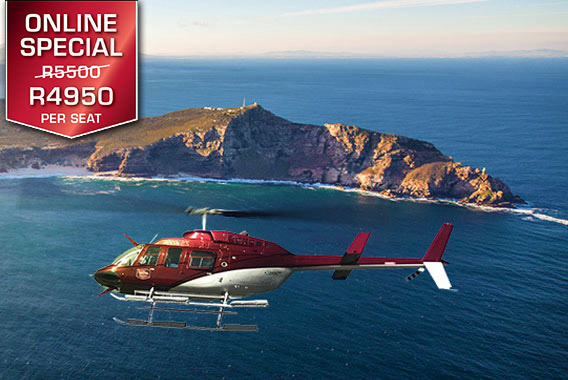 We can definetly recommend Sport Helicopters and team to host your next helicopter experience in Cape Town. Highly recommended On an impulse we decided to book a helicopter flight whilst visiting the Capetown Victoria and Alfred waterfront. Firstly the... read moreOn an impulse we decided to book a helicopter flight whilst visiting the Capetown Victoria and Alfred waterfront. Firstly the ground staff were all enthusiastic people and very professional. Flying in a helicopter was a first for me. Wow from take off to landing what an experience. Such fantastic views of Capetown , the Mountains and some of the Coastal areas. Our pilot was a most competent professional. On landing , what a nice touch.....we were offered a glass of wine. Amazing Amazing trip with some excellent staff. 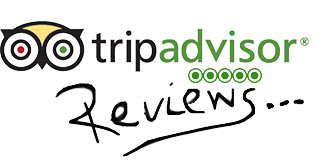 Yaseen was very helpful with the booking and we were booked in very quickly. Third trip, and just as much fun as the first one We've had a couple of trips with Sport Helicopters on previous visits to Cape Town and decided the time had... read moreWe've had a couple of trips with Sport Helicopters on previous visits to Cape Town and decided the time had come to fly again. This is a very professionally run outfit. The reception staff are great and very efficient. Our pilot this time was Alex. He's very capable and friendly with it. Certainly no worries at all about safety with him at the controls. 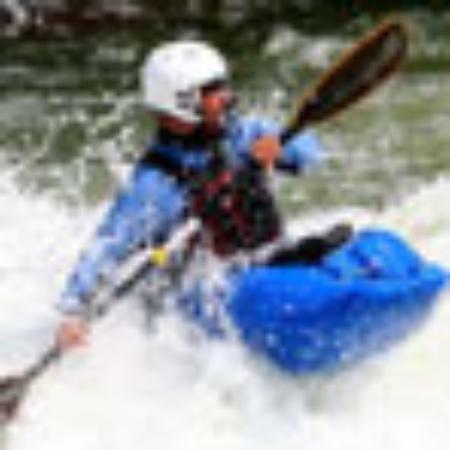 A MUST for Thrill seekers! A beautiful day out in Cape Town flying in the Huey. Stunning views of the city. 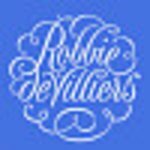 This is a FANTASTIC experience, highly recommended! Professional staff & a wonderful pilot. WOW!! Amazing team had a wonderful time with Alton at a 1 day Helicopter tour through South africa. Very kind and informative person. 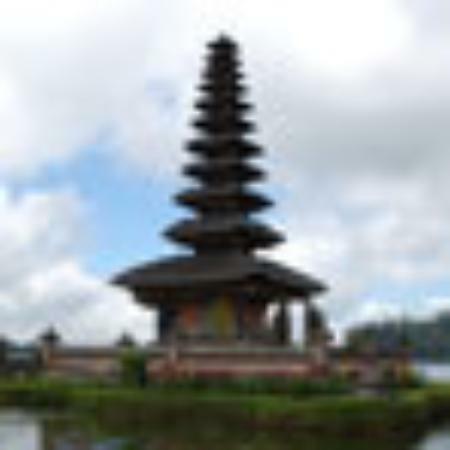 I highly can recommend to do such an trip. 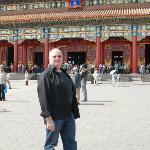 Its adding very high value to your experience, especially when treated so well from Alton and Mo. I would definitely recommend Sport Helicopters. RG MacDonald, trading as Sport Aviation, was founded in 2007 and is proud to have a 100% safety record. Our team from pilots to ground staff are incredibly well trained and we all value your patronage. Experience the ultimate rush of an adventure flight through the combat zone on a genuine Vietnam Huey helicopter.